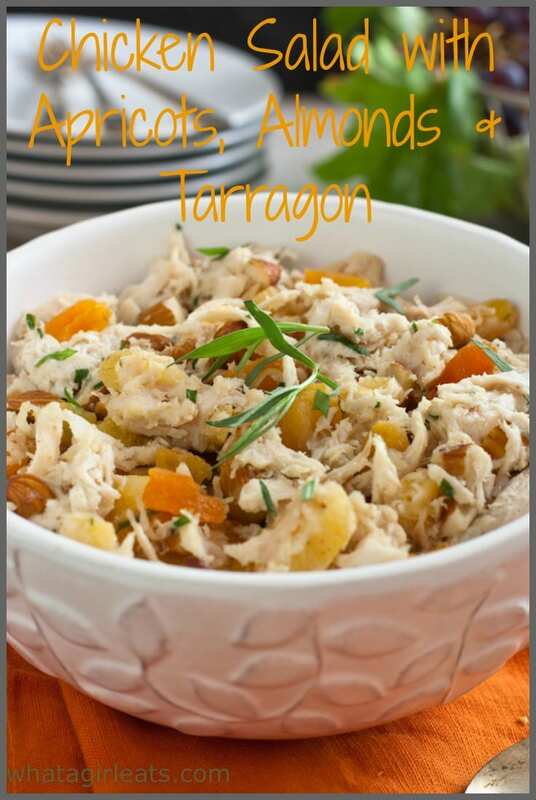 Apricot almond chicken salad an all white meat chicken salad with sweet apricots, crunchy almonds, and tangy fresh tarragon. I can’t believe it’s been nearly 8 years since I first published this Chicken Salad with Apricots, Almonds and Tarragon. 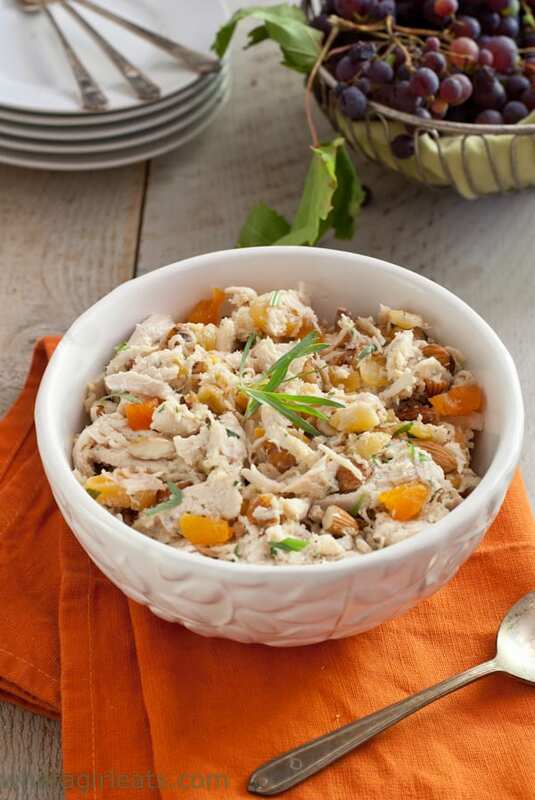 Creamy chicken salad with sweet apricots, crunchy almonds, and tangy fresh tarragon. It's low carb and gluten free. Mix all ingredients everything together and chill. Season with salt and pepper to taste. 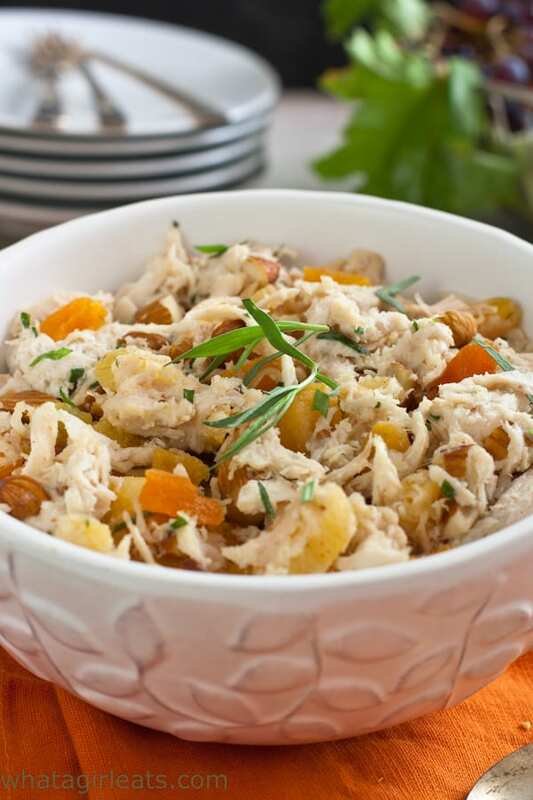 Delicious Chicken Salad with Apricots, Almonds and Tarragon. 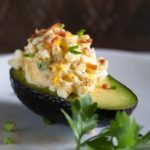 Gluten free, paleo and low-carb! Thanks Michael! Glad to have you visit! I don’t think I’ve ever seen such a pretty chicken salad! I totally understand your feelings with cooking being your passion…I feel the same way. It’s not always zen, but the feeling after creating something out of many different ingredients is so satisfying and uplifting. I just can’t understand when people say they don’t like to cook or bake…I just can’t relate! Hey Christina, I just saw this comment! We are cooking soul mates! I’ve always thought that cooking was like meditation for me. It’s a peaceful place where I can go and create. Thanks for sharing your zen thoughts. I especially like #5 for some reason it resonates with me. My mom loves chicken salad, I’ll have to make this for her. Thanks for sharing your recipe on Foodie Parties. I’ve pinned and stumbled it. Debi, I haven’t read that one for a long time…but #5 is my favorite too! I’m always in “A” mode, when I finally slowed down listened to my soul, it was whispering. I am making this for the Hollywood Bowl picnic next Friday. It sure looks great. Thanks Cathy! It’s one of my favorites! Ha, love the name of this recipe! I find my zen zone in the kitchen as well, it’s where time is my own and it moves at a much different pace then life. This chicken salad looks delicious! This is what I want for lunch! This looks like a wonderful lunch idea! 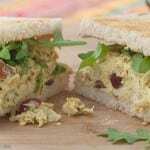 Your chicken salad sounds and looks amazing! This looks so good! 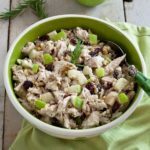 I love chicken salad and I really love that it can be a great use of rotisserie chicken leftovers! Yum! I totally hear you on how relaxing cooking can be! And even better if you have some tasty chicken salad like this by the time you’re through 😀 Would make a perfect lunch! I agree! I know it’s not relaxing for everyone, but it certainly is for me! Ah yes, what we did when we first blogged, so many bad photos on my part… ugh. I love your salad, although I’ve never been a huge fan of tarragon! What a yum fest! I always like a mustard-mayo combo. 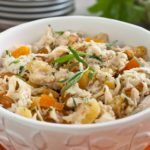 I messed around with a million variations of chicken salad as part of my take-to-work lunch a while back, and apricots and almonds rose quickly to the top of the list. Plus, anything with tarragon always seems so elegant. Nice recipe! This was the perfect lunch today – I had everything on hand! Thanks! how great is that? Thank you! 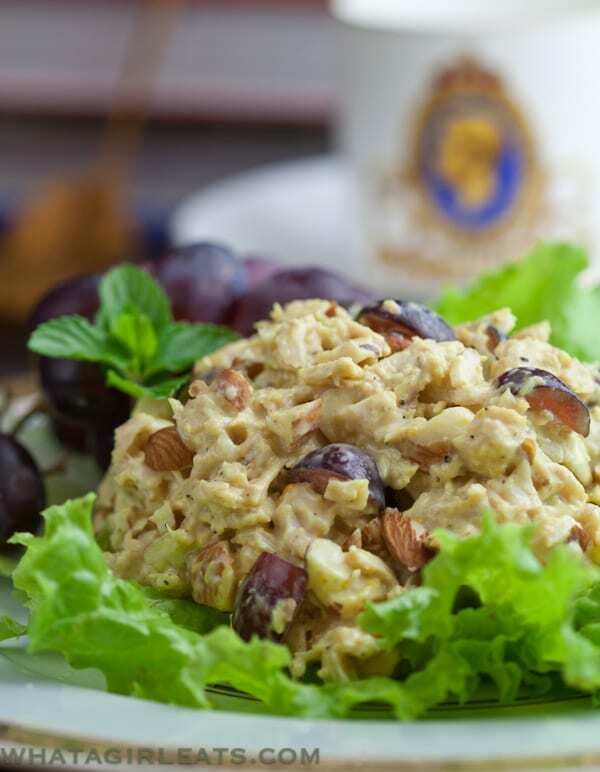 Mmmmm I love chicken salad, and what an amazing idea to add apricots! I’ll have to try this. I love any kind of chicken salad too…Thanks Jean! Fresh tarragon is my favorite herb. This salad sounds amazing with the apricots too. Pinning to make! Thank you Megan! Tarragon is an under used herb! I’ve totally forgotten about the apricot! What a great use for it in this salad. Nice tang! I always keep a bag on hand for a sweet snack! Love the addition of Coleman’s. Adding a little heat is such a great idea! I love adding coleman’s to all my mayo based salads! yes! Perfect for the summer or spring! Thank you! The sweet and crunchy make a nice twist! I’m loving the sound of apricots, almonds and tarragon in this salad. I don’t think I have tried that combination before – I need to! Thank you! 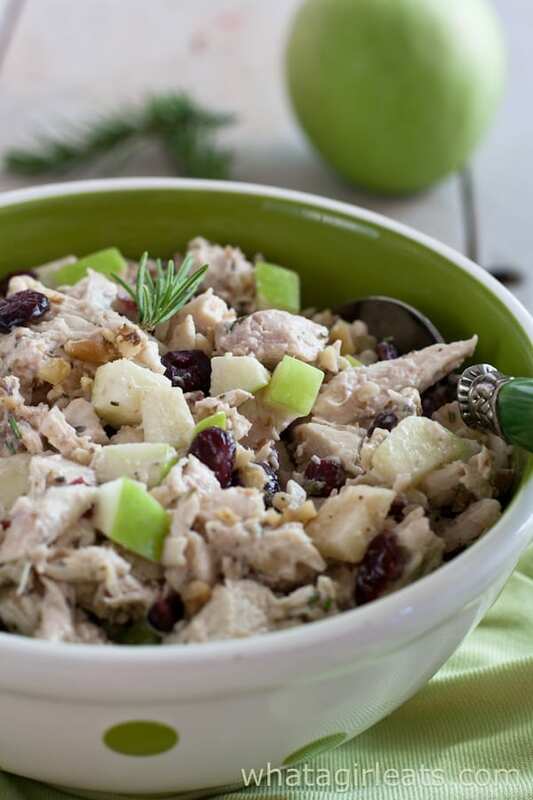 It’s really just a twist on a traditional chicken salad! Trader Joe’s made it a long time ago! So good!